Earlier this month, a Federal Court jury awarded $75,000 to Jeremy and Kristy Morris in their lawsuit against their HOA. The HOA lawsuit, filed January 2017, accused the HOA of anti-Christian religious discrimination. The jury agreed that West Hayden Estates Homeowners’ Association violated the Fair Housing Act, with its discriminatory behavior. The ordeal began four years ago, when Jeremy and his wife were in the process of purchasing their current home in 2015. While the house was under contract, members of the HOA board sent Jeremy and Kristy Morris a letter explaining why they disapproved of their plans for an annual Christmas light show. Jeremy, an attorney, said that, upon review of covenants and resrictions, he saw no legal obstacles to continuing his holiday tradition of spreading the good news of Christmas with his annual holiday program. So he and his wife decided to go through with the sale as planned. However, soon after the family moved in and began to decorate their home for annual Christmas program, the HOA threatened to sue the homeowners. Here’s the KREM-2 News video from December 2015. Following national publicity, the HOA temporarily backed down on its threat to sue the homeowners, and the December 2016 Christmas Light show went on as planned. 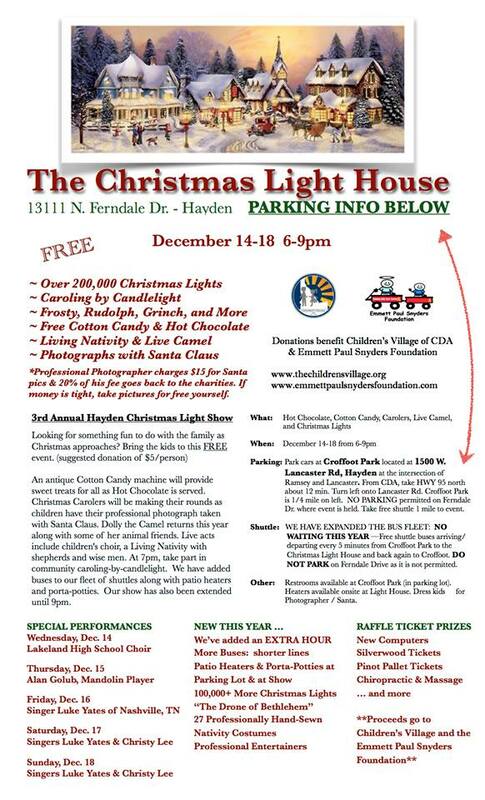 According to a flyer produced for the event, the 2016 Christmas light show was held at Jeremy’s home in West Hayden, from December 14 through December 18, 2016 from 6:00 PM to 9:00 PM. In order to avoid traffic problems in his community, Jeremy arranged to have visitors brought in by shuttle bus. The program ran for only 5 nights, ending by 9 PM. According to one previous report, the homeowners even purchased an insurance policy to protect the association from liability during the event. Jeremy’s next door neighbor said the Christmas lights and 5-day program did not cause her any disturbance. However, some unkind neighbors in West Hayden tried to spoil the fun during the 2016 event. They harassed some of the guests who visited the community to see the lights and participate in singing Christmas carols. In Janaury 2017, Jeremy filed a lawsuit against West Hadyen HOA in Federal Court. The lawsuit alleged anti-Christian discriminatory behavior on the part of the Association. As is common with HOA disputes, while the lawsuit was pending, Jeremy and his family were ostracized and treated with contempt by some of their neighbors. Under these circumstances, Jeremy cancelled his Christmas display for December 2017. But when Morris argued his case before a jury, they agreed that West Hayden HOA discriminated against his family, preventing free expression of their Christian beliefs. A homeowner in Idaho recently won a four-year battle with his town’s homeowners association (HOA) over the Christmas lights he displayed on his home. Morris said Sunday on Fox & Friends that the sellers of his home even testified in federal court that they didn’t want his family’s “beliefs” pressed on others. In Federal Court, the tide seems to be turning in favor of protecting homeowner rights. A legal expert quoted in this article from Coeur d’Alene Press notes the legal signficance of the Jeremy Morris v. West Hayden HOA case. Jeremy Morris credits his court victory to his accumulation of evidence of religious discrimination against his family. A prime example — the following legal exhibit. You can see why the jury’s opinion swayed in his favor. This entry was posted in Constitutional and Civil Rights and your HOA, HOA Community Association Disputes & Legal Matters and tagged Christmas, Idaho, religious discrimination by deborahgoonan. Bookmark the permalink. Next → Next post: How should Florida condo associations deal with radon?